With a 10 mph SW wind Mark set a beat down to 4, across to 2 then on to 3 and a run down to 8 then the typical 6, 7, start sequence. There were 21 starters in the Pursuit Race and it was good to see the Mirrors of Pat and Gordon out and Richard B making an appearance in his Laser. As usual William (Topper) was first back through start line followed by Gordon P (Mirror) then Ian C (Supernova), Karen (Laser), Peter S (Byte) and Steve P (Laser). By the finish gun Ian had taken the lead with Karen 2nd and Jon (Laser) had moved up to 3rd. Ellen & Newton (RS200) had moved up to 4th from 8th, Sylvia (Laser) was up to 5th from 9th and Steve P had kept 6th place. Mike & Sally (Leader) and Pat and Gordon (Mirrors) decided one race was enough excitement for one day, so there were 18 starters for the Handicap Race. At the end of the first lap Newton & Ellen RS200) were 1st, Ian C (Supernova) 2nd, and then the Lasers of Karen, Jon, Sylvia and Rod. Peter S (Byte) came through in 7th place followed by Curtis and Mike A in Lasers followed by Adrian (Vago). Then there were four more Lasers manned by Richard B, John W, Steve P and Alistair S. Next was Mike C (Solo) in a close battle with David M (Laser) and finally Hadey (4.7) and William (Topper). On the second lap the first six boats had maintained their positions, but Mike A and Adrian had both moved up two places to 7th and 8th respectively. Steve P had moved up one place and David M was up two places. for 6th place, Mike actually got in front of Jon round 6 and 7 only to lose out on the short dash to the line as Jon tacked slightly earlier. Curtis gained a place, John W and Mike C gained two places and Alistair S gained a place, so quite a lot of movement in this final lap. It was a pleasant evening for sailing with a 10 mph SW wind and the sun peeping through light cloud. Mike A set a longish beat to 4, then basically zig-zagged back up the lake via 2, 5, 8, 6 and 7 and back through the start. There were 16 starters and first back across the line was David C (Laser) just in front of Ian C (Supernova) and Karen, Sylvia and Curtis all in Lasers. Next through was Mike T in another Laser closely followed by Chris A (Solo) and Paul H (Supernova). Then there was a slight gap to Peter S (Byte) in 9th place who was pursued by the Lasers of Dean and Alistair J (good to see Alistair join us for his first Gillette outing this season). Mike C (Solo) was close to these two and being hotly pursued by Bob in another Solo. The Leaders of Sally & Stuart and Hugh & Hadey were next through, although Hugh & Hadey were having to play catch-up, as when the start gun sounded Hugh was tied to the jetty and Hadey was sprinting across the grass having got caught in traffic. Hadey took a flying leap into the boat as Hugh set off for the start line – a real old Le Mans start ! Bringing up the rear was David M (Laser), but this was highly creditable as David had only completed his RYA Level 1 a few weeks ago ! By the end of the second lap Ian had taken the lead and in fact kept it right to the finish. Karen was now 2nd and David 3rd, but these two had a terrific scrap changing places all through the race. Sylvia was 4th and Curtis 5th and they maintained these positions to the finish. Chris A had got past Mike T and Mike C had moved up two places. The third lap saw the 11 leading boats maintain their positions, the only change through the fleet was Sally & Stuart moving up one place to 12th by passing Alistair. After four laps David had passed Karen to take 2nd, Mike T had retaken Chris A to move up to 6th and Alistair had repassed Sally & Stuart. At the finish gun, Ian crossed the line in 1st place well ahead of Karen who had retaken David to take 2nd. Chris A had repassed Mike T and Paul H and Peter S crossed the line together impossible to split on time. The final positions on the water were 1st Ian – Supernova; 2nd Karen – Laser; 3rd David – Laser and these will not change on handicap. Good to see David M and Rick out on the race course again so soon after their initial training. Thanks to Mike A, Tracey & Amy T and Martin W for doing their OOD duties. In the Pursuit Race as usual William in his Topper was first back through the start line followed by Newton & Ellen in the RS200 and then Dave P (Laser). Paul R (Aero) was 4th followed by the five Lasers of Jon, Karen, Steve S, Richard S and Mike A. Next through the line was Mike C (Solo) pursued by three more Lasers helmed by Curtis, John W and Steve P. Then Roland & Ryan in a National 12 came through followed by Adrian (Vago) and Alistair S (Laser). Dean J in his Vago started the race but disappeared somewhere on the first lap. Final positions were 1st Newton & Ellen RS200; 2nd Paul R Aero; 3rd Jon Laser. The Pursuit Series leader is still Richard S but he is now being pressed by Jon. In the Handicap Race the leaders at the end of the first lap were Newton & Ellen with Paul R 2nd and Jon 3rd. There was a close midfield scrap between the Lasers of Richard S, Steve S, Curtis and Steve P. Dave P retired on this lap, but not sure why. The second lap saw the same two boats lead through the line and the biggest mover was Karen up from 10th to 6th. There were three retirements on this lap, Alistair S, Dean J and Roland & Ryan. Roland on being asked what his boat was, replied a b***dy handful. There are quite a few of these regularly sail at RSC ! The Handicap Series leaders are Newton & Ellen and they are going well in the RS200 so could take some catching. Thanks to James P and the OOD team of Phil M, David M and Tony R.
This Sunday just gone saw the second race of the BBQ series – “The Fastnet”. A group of a dozen or more intrepid sailors gathered by the club for the briefing for this, the most gruelling off-shore races, where it was explained to them that the Fastnet Rock in this case was mark 3, Land’s End mark 9 and the Isles of Scilly mark 1 (it just takes a little imagination !). The handicap and topper class were to do the full course, while for the oppies it was deemed cruel to send them all the way to Ireland, so it was just a leg to Land’s End ! 16 boats mustered at the start, and in keeping with the theme the weather was a blustery force 3 to 4. Tracy in her Comet was the first boat to go around the rock (the OOD has got remarkably good eyesight). Monica rounded second in her Europe, but not before having some problems remembering whether to pass Land’s End to port or starboard – port is a bit bumpy ! William was the first Topper to reach the Rock before making off towards the Isles of Scilly. Meanwhile, the two oppies, Jemima and Bea were battling their way down the channel to Land’s End. Bea had a little help in terms of rather a sizeable tow by the rescue boat (helmed by Jemima’s Dad ! ), while the OOD pretended not to see. Tracy and Amy were the first of the handicap fleet back to Cowes, but decided to give the second lap a miss and go off for a play. The Topper fleet were more resilient with all the boats setting off for a second lap. In the true nature of the Fastnet there were a number of mishaps, gear failures etc. Rhys for example lost his mainsheet and needed to be towed in. Others capsized and decided enough was enough. Anyway ignoring the Handicap fleet for a minute, William was the first Topper home, Ben second and Joe third. In the oppie battle, Bea pipped Jemima in the downwind run home. Full results below. In terms of the full series Joe leads the Topper fleet, with William 2nd, Edward 3rd, Sam 4th. In the Oppie class Jemima leads. Don’t worry if you have missed a race, after the 3rd race I will be applying discards so there is still all to play for. 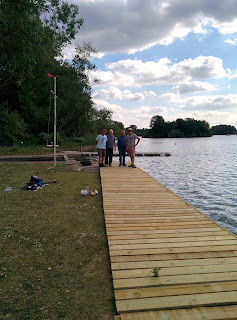 Thanks to Steve, Ann and Phil for providing the rescue boat cover. Next BBQ Series is this coming Sunday 28th June start at 14:30-ish. Monica will be running this as I will be climbing Snowdon ! The race theme ? The Volvo Around the World Ocean Race – best take sandwiches ! The Summer Handicap results can again be found by following this link http://www.readingsc.org.uk/results/summerH15.htm The Summer Pursuit results can be found via the racing results page. With a 12 mph North Easter, Curtis set a first beat to X, then to 5 down to 9, back up to 4 on the buoy line, down to 2 then 3 and back though the start line. There were 16 starters and first back through the line was Ian C (Supernova) followed by the Lasers of David C, Dave L and Rod with Newton (Solo) in 5th then Ellen (Radial) 6th. Then Mike C (Solo), Paul H (Supernova) and Steve P (Laser) came through very close together in 7th, 8th and 9th places. There was a slight gap to Sally & Stuart (Leader) who were some way ahead of Ralph (Pico) and Louis J (Topper) and Alistair J (Laser). Good to see Louis and Alistair back on the water. Then along came only the second doubler hander on the water, the 420 of Chris 7 Carol. Steve S was down as starting but did not complete the first lap, not sure what happened, but probably gear failure. The only change on the second lap was Paul H gaining a place by passing Mike C and on the third lap everyone maintained position apart from Steve P slipping past Mike C.
By the end of the race Mike C had reversed this but again the rest of the fleet had kept station ! The final positions were 1st Ian C; 2nd David C; 3rd Dave L.
Thanks to Curtis and the OOD team, Hugh, Karen and Mark. The Summer Series is well under way even if the Summer weather has not quite caught up – a bit like this Jolly Sailor ! This year there is a short pursuit race immediately followed by a normal handicap race. The first Sunday 7th June saw a light wind and a fleet of 24 boats set out in in the first Pursuit Race. At the end of the first lap Mick G in his Otter came through the line in 1st place followed by Hadey (4.7) 2nd and Pat in her Mirror 3rd. Mick and Hadey were never caught and at the gun were still 1st and 2nd, but David C (Laser) had moved up to take 3rd place. This may be the first victory for an Otter at RSC so well done Mick. In the following three lap handicap race it was Paul R (Aero) who crossed the finish line in 1st place followed by Newton & Ellen (RS200) and Richards S 3rd in his Laser. Thanks to Mark and his OOD team for coping with the new format successfully. The second Sunday 14th June saw more wind, but a much reduced fleet of 12 boats. In the Pursuit race strangely the first two boats through the line at the end of the first lap again stayed ahead right to the finish, these were Newton & Ellen (RS200) in 1st place and Richard S (Laser) in 2nd place. On the first lap Mike C (Solo) was 3rd, but he was passed by Jon (Laser) before the finish gun. In the following Handicap Race Newton & Ellen took the honours again by crossing the line in 1st place but this time Jon was 2nd with Richard 3rd. Thanks to Ian C and his OOD team, Roland L, Roy T and Paul B.
Sunday afternoon saw the first in a new series designed to encourage the younger members of the club (and/or for those new to sailing) into some informal and fun racing and to make use of those hopefully glorious summer Sunday afternoons. Anyway the theme for Race 1 was the IOW Round the Island (no prizes for guessing the course !) and 12 boats took part, 4 in the adult handicap class, 7 youth toppers and 1 intrepid oppie ! The afternoon saw some lovely sunshine and some useful (but not too useful) winds even for getting around the lee side of the island. The course was 3 laps or whenever the OOD got bored ! Monica in her Europe lead the fleet off at the start and showed the way around the island, particularly where the wind was on the lee-side. Took a while for the following fleet to twig this ! Anyway Monica was followed by gaggle of Toppers, including Joe, Edward, Sam Alex and Luke, William, Rhys, Jemima in her oppie, and two lasers. Monica of course made it look too easy, finished the first lap in just over 5 mins and completed the other two in an overall time of 20m:25s to romp home in 1st place which ever way you looked at it. There was some hard competition going in the Topper fleet behind them with positions changing a number of times. The competition was possibly a little too intense at times – Rhys I am pretty sure racing rules do not allow the use of water pistols on opposing boats ! Jemima did well to keep in contact with the rest of the fleet and to put up with the contrary winds behind the island. Anyway, after Monica, Joe came home as the first topper, with Edward just behind him. Edward would have made 2nd if passed on the right side of the finish mark on the first attempt ! Sam was the 3rd youth topper, with William as the 4th. The full results by class are shown below. After the racing came the BBQ bit with a couple of the families taking advantage of the weather to light up the BBQ and enjoy the summer evening. 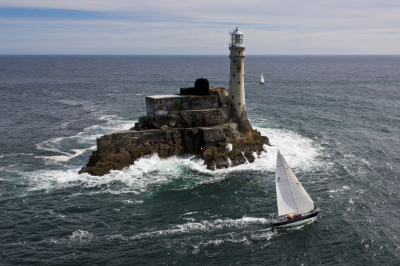 The next race in the series – the “Fastnet” – is on Sunday 21st June 14:30 (ish) start. So come on all you budding topper racers why not come along and see if you can knock Joe off his pole position. We also need more oppies to give Jemima a run for her money.